It looks like The Artful Detective TV show will be renewed for season 12 on Ovation TV, with a start date TBD. Back home in Canada, the series goes by the title The Murdoch Mysteries, on CBC, where the season 11 finale just aired, last week. Now, showrunner Peter Mitchell, writer Mary Pederson, and star Hélène Joy are already teasing the 12th installment. An Ovation Victorian mystery drama, The Artful Detective stars Yannick Bisson, Hélène Joy, Jonny Harris, Thomas Craig, Lachlan Murdoch, Georgina Reilly, Kristian Bruun, Arwen Humphreys, and Mouna Traoré. The Canadian mystery drama centers on William Murdoch (Bisson) — a good-looking, innovative Toronto detective. Murdoch uses fingerprinting, UV Light, and trace evidence in his investigations. Working alongside him to crack the city’s grizzliest murders are pathologist Dr. Julia Ogden (Joy) and Constable George Crabtree (Harris) — Murdoch’s righthand man. Greg David, of the Canadian website, TV, eh? talked to Mitchell, Pederson, and Joy discuss the season 11 finale and the upcoming 12th season. Check it out. While Ovation hasn’t announced a season 12 renewal for The Artful Detective, sometimes US cable networks don’t announce renewals for the Canadian series they run. We find out about it, when they announce the new season premiere date. Ovation first picked up the series in 2013, and since then has run all of the seasons, to date. What do you think? Are you a fan of The Murdoch Mysteries, i.e. The Artful Detective TV series? Do you plan to check out season 12 on Ovation or CBC? Let us know, below. 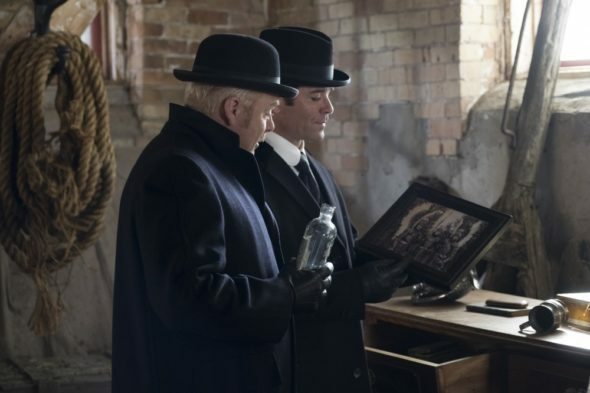 More about: CBC TV shows: canceled or renewed?, Murdoch Mysteries, Murdoch Mysteries: canceled or renewed?, Ovation TV shows: canceled or renewed?, The Artful Detective, The Artful Detective: canceled or renewed? Would love to watch this again! What a great series! It can’t start too soon! Its a great series – I really look forward to watching it every week and I am not that keen on many TV shows at all!!!! I think it mixes drama with suspense and comedy very well………. I absolutely love this show. Very well written, keeps me on the edge of my seat. Well acted also. Wish we could have this quality program here in the states.